Our first Labor Day Weekend together, my significant other (Dennis) and I decided to go yard sale-ing around the Hudson Valley and Catskills. We got up early and grabbed some doughnuts, hazelnut coffee, and local newspapers from a nearby Stewarts, and made a plan of attack: yard sales in Kingston and Saugerties first, then an estate sale in Woodstock, and last, a barn sale in Bearsville. Chairs, tools, and funky furniture were on our wishlist. By the time we got to the estate sale it was late morning and there was a steady stream of people in and out. Most of the larger furniture items were either sold or kinda junky. 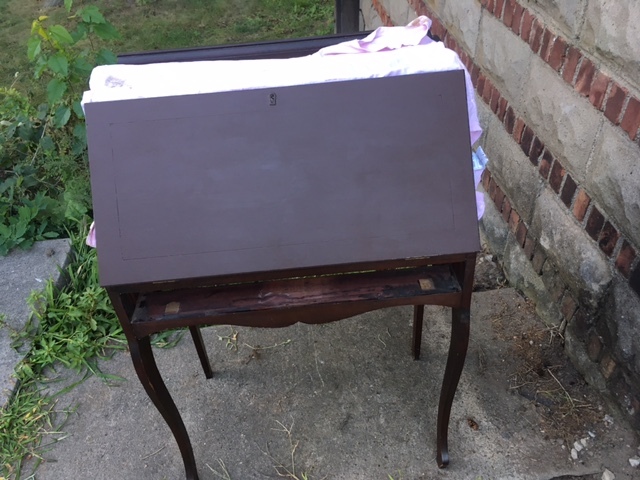 Then I saw her, hiding in a corner, displaying some dusty $3 tchotchkes: a small secretary desk with its front veneer chipping off, but with great bones. No price tag. I asked a fast-paced woman with a clipboard (clearly in charge); she gave a glance to its left and right, scrunched her nose, and asked, “Eh, $30?” Dennis asked, “$20?” “Sure!” she said, shrugging and moving onto the next inquiry. Perhaps it’s the writer in me, or the fact that I adore whimsy (or both), but there’s something about a secretary desk that just draws me in. There’s a sense of purpose. You don’t just sit and write and leave, you pull open the door and settle into this little hidden atmosphere with intention; when you’re finished, you close the door — finality. It’s a desk that’s filled with stories; literally, because you can store them there. 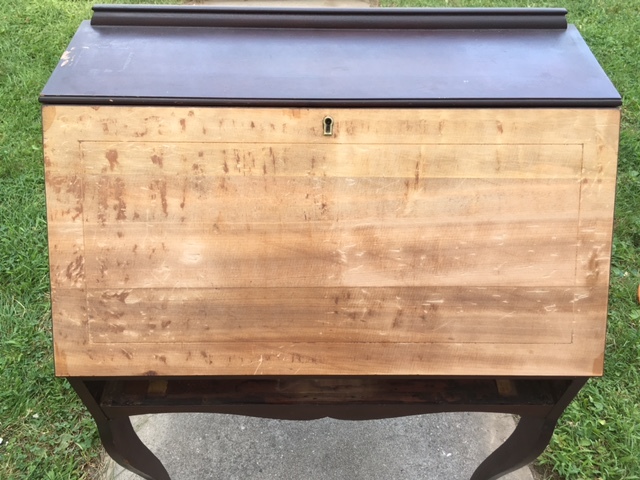 We packed it into the truck and went back for more with treasure-hunter eyes, scouring each room for another hidden gem… but none to be found that excited me the way the desk had. He bought a few tools and we moved on to the next sale. 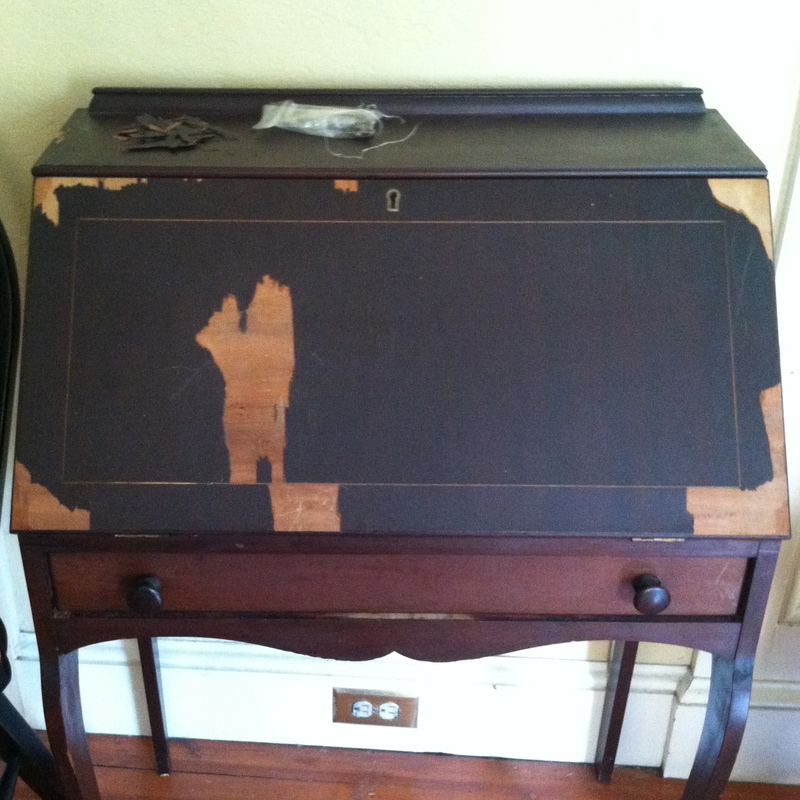 Eventually back at the house, I started thinking of all the ways I could refinish the desk’s front. 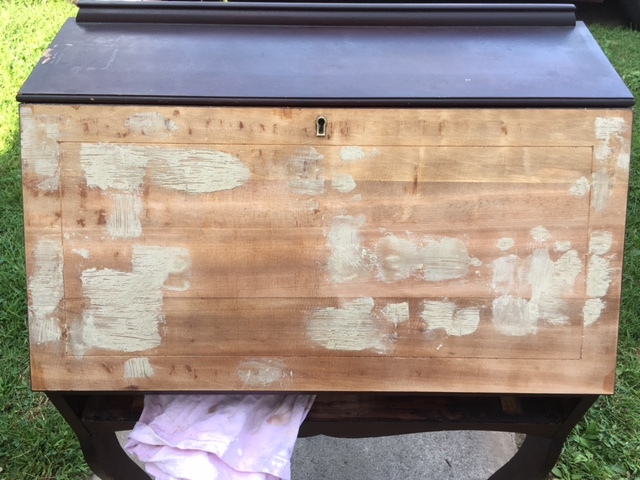 Stain, paint, decoupage? I decided I’d at least begin removing the peeling veneer the following weekend, when Dennis would be away on a trip to climb Mt. Rainier. And this is how I learned to never refinish furniture when you’re stressed. While he was away, I read an article about climbers who attempted the same climb but had died, just weeks before he was there. That worry, plus a glass of wine, are what I blame for taking a scraper a little too intensely into the desk, leaving several pock marks where I needed a smooth surface. Over time, I tried to fix my aggressive digs as much as possible, power-sanding away (which helped a little). But as other home renovation projects, travels, family parties, and general life moments came up, the secretary sat in the corner, looking just as weathered as she did when I found her, only more bare. Then August rolled around. 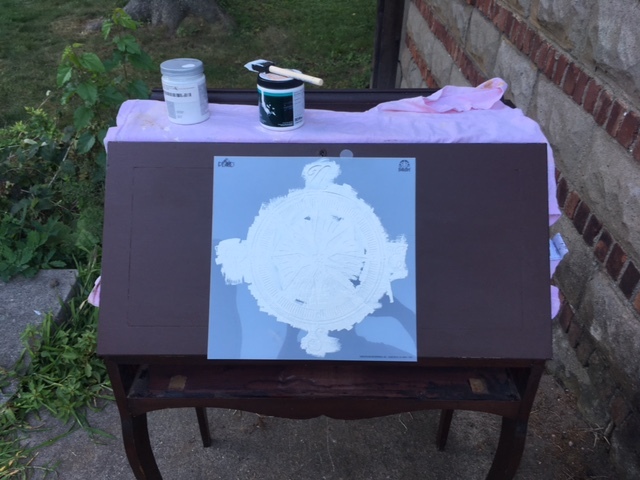 Determined to finish this project before the next Labor Day, I grabbed some wood filler, sandpaper, paint, and a stencil, and went to town. Filled in the marks. Sanded. Filled in the marks I missed. Sanded. Sanded more. 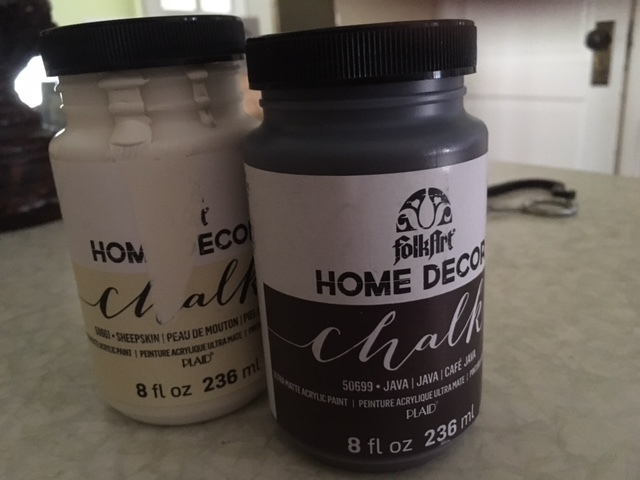 Went to Michaels, bought Folk Art Chalk Paint in Sheepskin and Java. Painted the first layer Sheepskin and the second layer Java, with intent to lightly distress the edges. 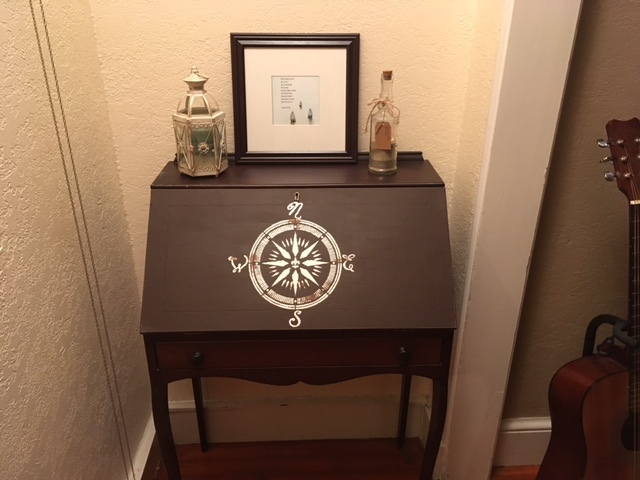 Taped on the stencil, used a Behr paint sample (Sleek White) and a sponge brush (I wanted a glossier feel than the chalk paint). It was going great! Then I removed the stencil… and bits of the paint with it. Right down to the bare wood. But then I stepped away, grabbed a beer (Southern Tier Pumpking), and when I came back, I kinda loved it. It looked more “intentionally distressed” than “Pinterest fail” and Dennis even said he loved it, too (although I’m still not sure if I believe him). The next morning, I still loved it. Talk about a happy accident! So there we are: A saved secretary that was first ruined more, saved a little, ruined again, but eventually loved despite her flaws.